Wheels has been designed and built to a standard rather than a mere specification. Her distinctive shape, practical layout, lavish interior and supreme comfort are the result of great attention to detail. Designed by Tamaso Spadolini, the curved low profile shape is formed from a deep hull and large, sleek window. The hull provides a soft assured ride whilst the windows provide light, airy interiors. On the upper deck the yacht's tender and jet skis are neatly stowed and craned onto the water to reveal sunbathing space around the Jacuzzi. A full width teak laid swimming platform provides easy access to the water or the equipment. Inside, Wheels has been designed by Evan Marshall in a bold, bright and rich style. Engraved glass door panels, birds eye maple wall panelling with stained maple columns, diamond platterned marble floors with brass trim and pale damask upholstery all combine to dazzling effect. The dining area, with its enormous mural of Botticelli's Primavera, is cleverly linked to the main saloon by a bar that serves both areas. This main deck area is remarkably spaceous for a yacht of this size and could easily accommodate a large party with drinks and food available both inside and outdoors. Ten guests sleep in large, luxuriously appointed, double or twin staterooms, all of which are decorated to the same impeccable standard. 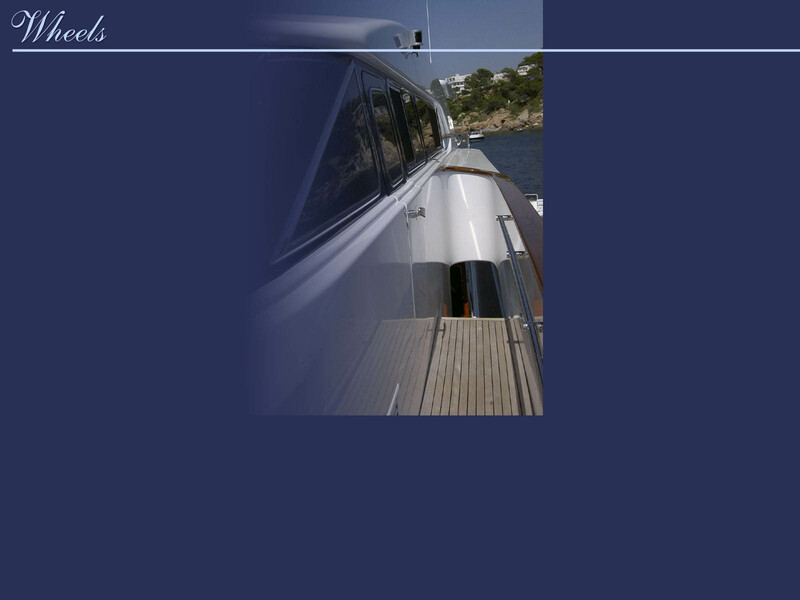 The crew of six make chartering Wheels a fantastic holiday - with efficient, thoughtful service twenty-four hours a day.